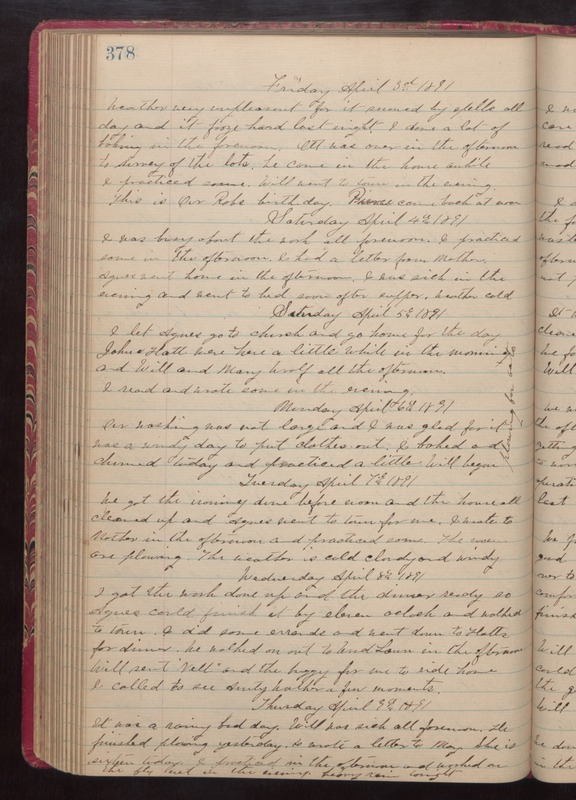 Friday April 3rd, 1891 Weather very unpleasant for it snowed by spells all day and it froze hard last night. I done a lot of baking in the forenoon. Ott was over in the afternoon to survey the lots. He came in the house awhile I practiced some. Will went to town in the evening. This is Our Robs birthday. Pierce came back at noon. Saturday April 4th 1891 I was busy about the work all forenoon. I practiced some in the afternoon. I had a letter from Mother. Agnes went home in the afternoon. I was sick in the evening and went to bed soon after supper. weather cold. Saturday April 5th 1891 I let Agnes go to church and go home for the day. John & Hatt were here a little while in the morning and Will and Mary Woolf all the afternoon. I read and wrote some in the evening. Monday April 6th 1891 Our washing was not large and I was glad for it was a windy day to put clothes out. I baked and churned today and practiced a little. Will began plowing for oats. Tuesday April 7th 1891 We got the ironing done before noon and the house all cleaned up and Agnes went to town for me. I wrote to Mother in the afternoon and practiced some. The men are plowing. The weather is cold cloudy and windy. Wednesday April 8th 1891 I got the work done up and the dinner ready so Agnes could finished it by eleven oclock and walked to town. I did some errands and went down to Hatts for dinner. We walked on out to Wood Lawn in the afternoon. Will sent "Nell" and the buggy for me to ride home. I called to see Aunty Walker a few moments. Thursday April 9th 1891 It was a rainy bad day. Will was sick all forenoon. He finished plowing yesterday. I wrote a letter to May. She is sixteen today. I practiced in the afternoon and worked on the fly net in the evening. Heavy rain tonight.